I received a complimentary product for the purpose of this review. 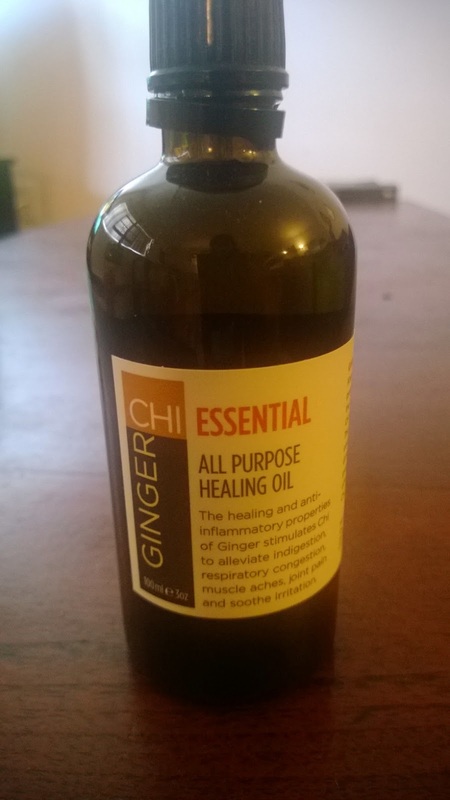 I was lucky to try out GingerChi's All Purpose Healing Massage Oil. GingerChi is a brand that I can understand. Through the power of ginger and it's natural healing properties we can have beautiful and healthy skin. You may have heard of ginger before and you may have tasted ginger in your food. Have you ever heard of Chi? Chi or Qi, according to Chinese culture, is the life force present in all living things. When Chi flows freely through our bodies, we can obtain optimal health. -Can slow the aging process. Ginger is rich in antioxidants and can repair damage caused by free radicals. A while back before I had kids, I had gone to school for an Acupuncture program. I never finished the program but will always have great respect for those who practice Traditional Chinese Medicine. I believe in the healing power of Acupuncture and Herbal Medicine. Alternative medicine and natural healing is something I would always try first. My husband used the GingerChi All Purpose Healing Oil on his back. He has frequent back aches and has used Tiger Balm in the past. He really liked this massage oil and wants me to put it on his back from now on. I like the smell of this oil much better than the Tiger Balm smell. I used it on my calves and lower back. For some reason my calves have been sore. Maybe from carrying my kids up our apartment stairs. The All Purpose Healing Oil soothed my sore muscles. I would use their products again. Their value sets would make a great gift for a friend or family member. You can follow GingerChi on Facebook and Twitter to get the latest news on their products. You can purchase their products here on the GingerChi website. Do you use any natural beauty products? What is your favorite natural remedy?